‘World In 2019’ Economist Mag Cover Hints At The ‘End Game’? Thread: ‘World In 2019’ Economist Mag Cover Hints At The ‘End Game’? Re: ‘World In 2019’ Economist Mag Cover Hints At The ‘End Game’? Why an armadillo? Portends an overturning of the present order? Vitruvian man (us - the unwashed masses) holding weed, and a baseball and mark-of-the-beast on the one hand - population anesthesized, distracted and accounted! Notice his virtual reality goggles! Vitruvian man's other hand holds GOLD over a balance of populations: those who have the GOLD (China, Russia and members of the Silk Road initiative) make the rules; populations without GOLD (USA and EU) sink into third world status. Four horsemen of the Apocalypse underneath Putin's pipelines: Russia's natural gas to Europe and Asia will deliver the final deathblow to the Petrodollar and an American economic apocalypse comes. Dunno what that’s supposed to represent but it doesn’t come close to looking like an armadillo. 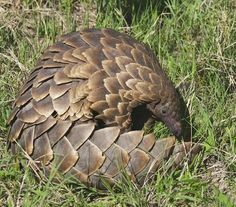 Pangolin, cousin of armadillo, an endangered species. Are TPTB trying to tell us something? We don't need the Rottenchilds telling us we're in the sixth mass extinction which has been going on for nearly 50 years. NO shortages of armadillos in this part of the country. Heard they're good eats - and the scales make excellent pavers! Dine on armadillo? Ewww, gross (I have, unbeknownst to me until after the fact, it was not a pleasant experience). Don't you know that armadillos have been known to be leprosy vectors? FYI, the 'armor' on armadillos is pretty lame, it's more like skin. When one of my dogs chomps down on one (on the 'armor') it instantly dies with the armor skin being penetrated. Surprised me first time that happened but I've seen it replayed many times - an armadillo's 'armor' is just useless against any predator with the armadillo not surviving the initial bite (nothing special about the bite of the medium sized dogs I had at the time). If a 50# dog gets an armadillo in it's mouth it's certain death for the armadillo. I haven't seen anything on their covers that merit anything happening in real life. I'm sure in their minds they are pushing for globalism but it's backfiring in big ways all around us. Look at the French, chased Macaroni right out of France. Where is he hiding now, Marrakesh i think i heard last signing away more rights of the French people to the UN globalists. Other countries in euroland are saying no to the global agenda as well. I don't pay attention to their rag at all anymore.